Continuing Robs storyline, Meriem is failing to cope with the stressful pain of Bruces death. She irrationally continues to lash out at the animals of her prehistoric world and has decided to go on another hunt. 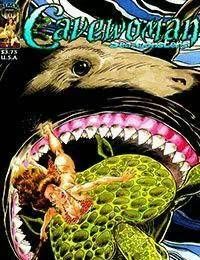 This time shes chosen to face off against one the mightiest animals to ever swim the ancient oceans of early Earth, the Great Megalodon Shark! Its an aquatic battle royal as Meriem hits the water to kill or be killed.